A deliciously healthy carrot hummus, adaptable to every possible color of carrot, easily made by pureeing all ingredients in a food processor. 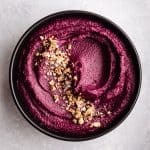 Please meet my very purple Dragon (aka Purple) Carrot Hummus. 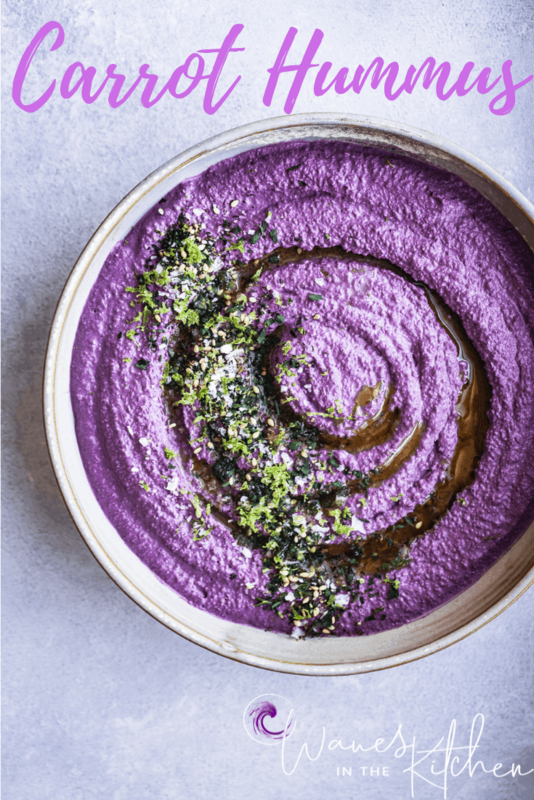 Since the very first hummus recipe I shared on here was purple, it seemed apropos that the 2nd hummus recipe I share would be…also purple!!! Just to, ya know, really nail in the notion that I’m a purple-licious kinda gal. After all, I found my visual voice and it’s clearly very, very, very purple. The addition of carrots adds a fun, healthy, and slightly sweet twist to classic hummus. 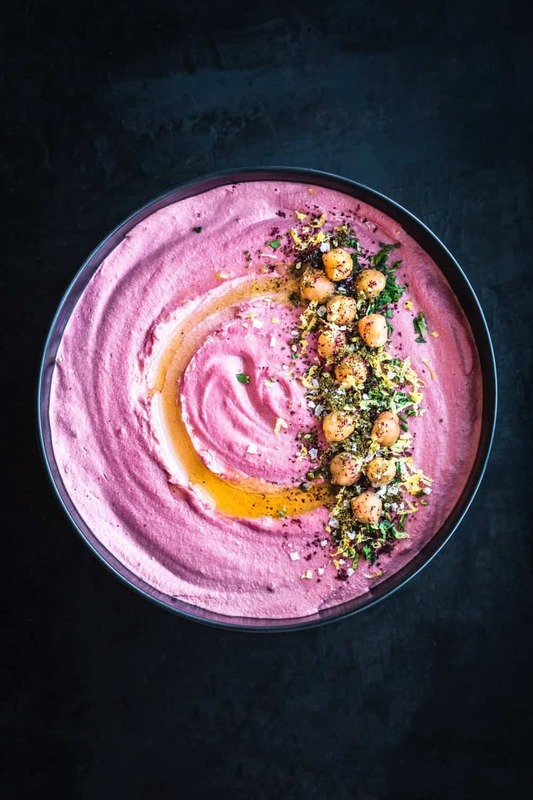 Pureeing all the ingredients in a food processor means this hummus very easily and quickly come together. I’ll let ya in on a little secret: my beet hummus and this dragon carrot hummus are exactly the same as my plain hummus (which I’ll be sharing next!) 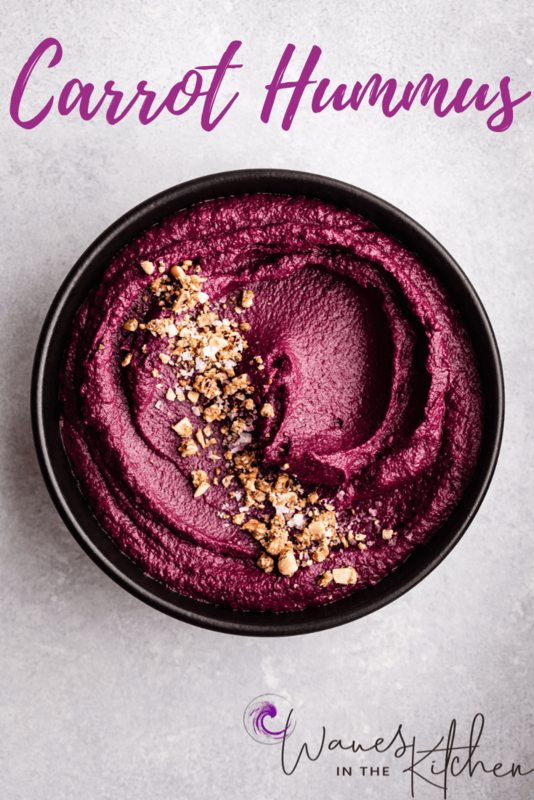 with the simple addition of a roasted beet or steamed carrots. And the sky is the limit! If it’s a veggie it can be a hummus flavor I say! Let’s chat a bit about purple carrots. 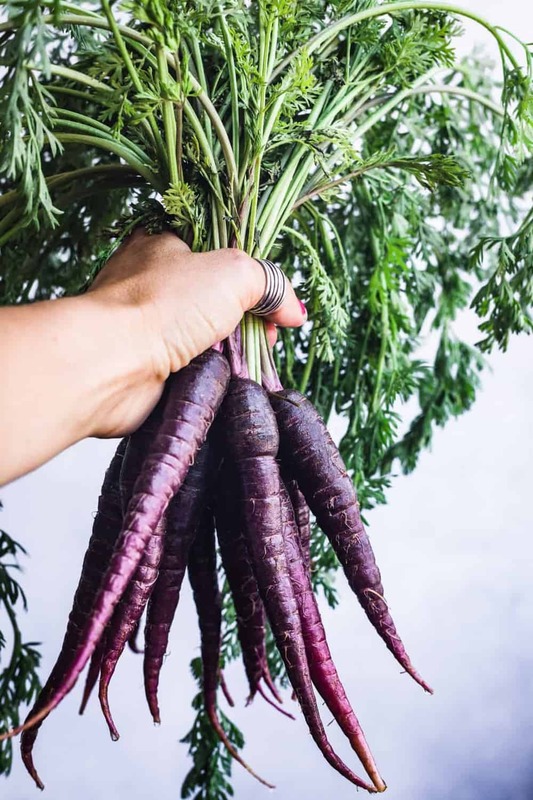 Did ya know that the very first carrots ever cultivated were actually purple? Then yellow and white? For reals! 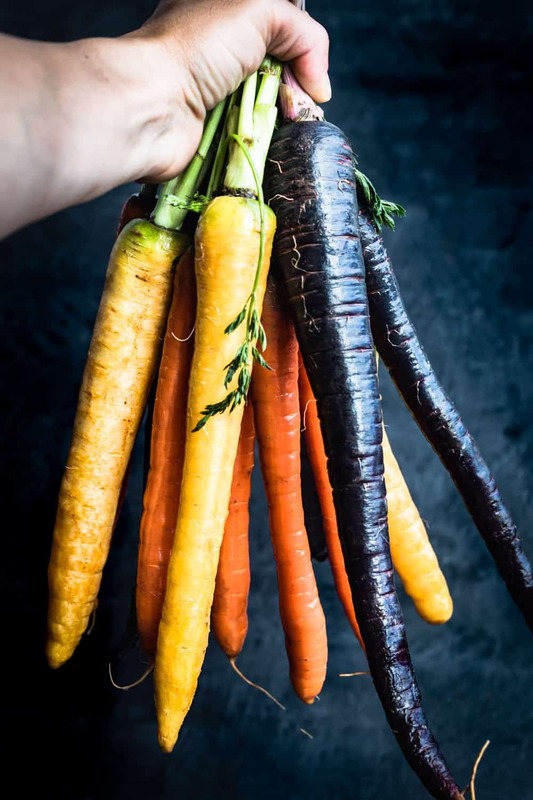 Then in the 17th century, a strain of carrot was developed by the Dutch that contained higher amounts of beta-carotene and those became the first orange carrots. Orange carrots became the norm. And purple carrots became the minority of the carrot world. I vote for making them the majority again! Anyhow, there’s a brief abridged carrot history for ya. 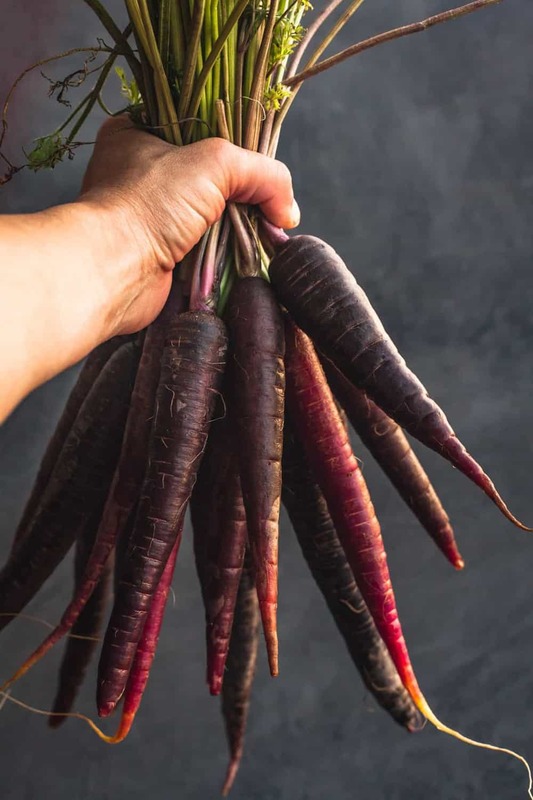 Note: Many varieties of purple carrots are yellow or orange on the inside. Ya gotta find ones that are purple on the inside too if ya want to get a saturated color like the ones in my pic. You can’t really tell from looking at them which color they’ll be on the inside so be sure to ask. In terms of taste, there is a bit of variation in flavor between each of the colors, albeit very slight and subtle, and mostly notable when eaten raw. The purple ones are much sweeter and slightly spicier than their orange counterparts. But I must work on my carrot palette cause honestly they taste very similar to me…though I can often tell differences between different orange carrots. Guess the moral of the story is that not all carrots are created equal! But duh, I know all about that in the produce world…but will spare ya a rant about how many veggies have no taste at all due to how they’re grown. Suffice it to say: buy local and organic (even if not certified) when ya can! In terms of flavor, the hummus will come out pretty much the same for all practical purposes. Unless, that is, you have a much more developed carrot palette than I. I’ve made orange hummus, and yellow hummus and coral hummus and a white-ish hummus all by using carrots of those respective colors. I recommend using a food processor to blend all the ingredients together. If you don’t own one, a blender or a mortar and pestle and lots of elbow grease work as well. Get creative and play around with adding different spices in the hummus. I probably have way too much fun making hummus of all colors of the rainbow when hosting dinner parties! And even more fun watching the guests trying to decipher how they each may taste different from each other. When I do wanna mix it up a bit so they’re not all too similar, I’ll replace the lemon with limes in one, add roasted instead of raw garlic in another, and/or change up the spices. I’ve had some guests that can’t eat legumes so sometimes will make one with only tahini…ya get the idea on the variations by now I think. Let’s get our rainbow hummus game on! Combine the chickpeas, tahini, chopped steamed carrots, lemon juice, lemon zest, garlic, cumin, and salt in the bowl of a food processor. *Note: to steam the carrots, use a steamer basket if you have one. Otherwise, bring about an inch of water to boil in pot, place the chopped carrots and steam until tender, about 10-20min. Larger pieces of carrot will need more time. We love this so much! Post notifications are definitely on now! YAYA! Really appreciate the feedback! Thanks so much :). ? I have eaten this and can say it is truly a crowd pleaser – both delicious and gorgeous!!!! You are too kind!!! Thank you Orlee :)! So happy to hear that!!! Thank you :). ?? ?